Two high profile employers in Rotherham are offering higher and degree apprenticeships, providing a direct career pathway into sought after professions. Roles at Atkins and Rolls-Royce are being showcased by the Government as apprenticeships are a central part of current policy. Degree apprenticeships, launched by the Government in 2015, offer a real alternative to traditional university study. The apprentice combines studying for a high-quality degree with the acquisition of key vocational skills, all whilst earning a salary from day one with tuition fees covered by the employer and government. Available at levels 4-7, they combine work with study and may include a work-based, academic or combined qualification; or a professional qualification relevant to the industry. 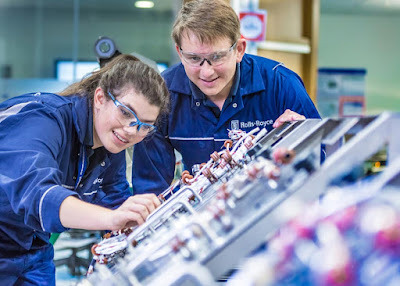 Leading manufacturer, Rolls-Royce operates a highly successful apprenticeship scheme and is taking on new staff in Rotherham and other UK locations through a manufacturing engineering degree apprenticeship. The four year degree apprenticeship provides the opportunity for A-level students to study towards a manufacturing engineering bachelor's degree and work alongside world-class engineers. Applications are open until March 2 2018. Atkins, Europe's largest design and engineering consultancy, is harnessing the next generation with a degree apprenticeship focused on the energy sector. Atkins global energy team employs engineers that push the boundaries to create cleaner, safer and smarter energy. It operates an office in Rotherham previously known as M G Bennett and Associates and based in Whiston. The section provides engineering, design and consultancy solutions to the oil and gas, nuclear, renewables, electrical generation, transmission and distribution sectors all over the world. Degree apprentices will support engineers creating ground breaking designs for all kinds of projects and study towards a level 6 qualification. The initial closing date is December 18. Sue Husband, director of the National Apprenticeship Service, said: "Higher and degree apprenticeships are broadening opportunities for individuals to achieve high-level qualifications to sit alongside invaluable skills they gain from their apprenticeship. Seeing the many opportunities now available is a very exciting prospect. More and more apprentices will be achieving the high-level skills our economy needs to compete; whilst employers benefit from employees with both the practical skills and degree level knowledge required in these professions. "The apprenticeship job roles now available at higher and degree level continue to grow and it’s extremely positive to see more and more employers advertising apprenticeship vacancies at these levels."